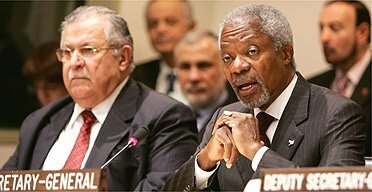 Emperor Kofi [seen here with Viceroy, his dukiness Al-Jaafari aka Jaafar the Hut] have been given permission by Washington to make 'grave' remarks concerning Iraq. Apparently Iraq is on the verge of civil war...really? No! !